BUT, that’s going to happen right now! After months and months of searching and searching, looking for the best riggers and model makers in deviantArt, I have found the best ones that look the best! And the most similar to the professional models! I have been wanting to share with you one of my biggest achievements in finding the best models that are hard or difficult to find. You know models that look like these? Compare the differences and find the ones that look better. Fiddle with their toon files and spa’s and see if they look better, if they don’t, undo the changes. I have come across the best artist on DA, and it’s Luke-Flame (http://luke-flame.deviantart.com/) for the best looking Project DIVA Arcade Future Tone models. He makes not just the default models, but also all of the customized models from Miku, Rin, Len, Meiko, Kaito and Luka, he doesn’t stop! Make some adjustments to the lighting and it’ll look just like the game! 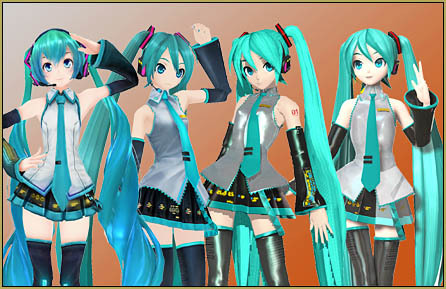 There are many artists out there such as, Mikudaven, Pleumschool, Luka-Flame, ManJapanUniverse and so on. Never give up on searching, look around, ask friends, ask artists, go around and find these things. i wanted to say, how do you load the pdf model? i looked to see if there were any pmd or pmx files. and their weren’t any. HELP ME!!! There’s no such thing as “pdf model” (spellchecker getting bossy, eh?). To load a .pmd/.pmx model, use the “load” button in the Model Manipulation Panel. There are few basic .pmd models in MMD’s “UserFile/Model” folder They will do for starters. To download more models (and there are tons of) you’ll have to search for them. Looking through deviantArt for “mmd model download” would be a good beginning point. im not talking about spellchecking, im talking about when i download the project diva f model (pdf) i looked in the rar file and i found no pmx or pmd files. OK, sorry for misunderstanding, I see what you mean now. 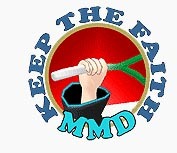 Yes, there’s no .pmd inside this particular archive. Apparently, it’s not a MMD model and it got into the article by mistake. Supposedly, you still *can* convert it for MMD if you import it into Blender using XPS Tools plugin and then from Blender into .pmd using MMD Tools (or some other plugin; AFAIK there’s several). I haven’t tried it for myself, but there’s a fair chance that you’ll have to do a lot of additional editing to the converted model before it’s ready to play; not sure if it’s worth the hassle. There’s always more fish Mikus in the ocean. Im just a beginner. but i can try. hopefully i can play around with this model, im good. ok yeah im not really into blender. and WHAT IS XPS TOOLS?! im confused. im just gonna find another model. and i can’t find the password for the burenai ai de models . and i don’t know anything about malaysia. XPS Tools is a plugin for Blender for importing and exporting XPS models (such as the one you asked about). The link I provided points to where you can download it and how to use it. I haven’t used it myself, so can’t help much beyond giving a direction. As for passwords… look into comments, there can be helpful clues. Usually, people who want their models to be downloaded don’t place passwords too difficult to find by brief googling. I am sending you an email to get this info to you.